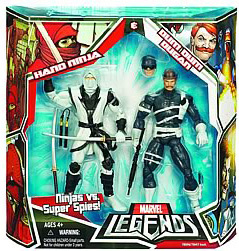 Description Of Item: Hasbro Marvel Legends 2-Pack: Hand Ninja and Dum Dum Dugan. The Marvel Legends line gets twice as exciting with these dynamic 2-packs! They combine some of Marvel's fan-favorite champions and adversaries.Each figure features a detailed sculpt and character-appropriate accessories.